BDD: Is there a difference between programmer and tester? Worth a look – I was searching around for different examples of programming lanmguages and came across Inform. Inform is “A Design System for Interactive Fiction Based on Natural Language”. An example of its implementation is here http://www.inform-fiction.org/I7Downloads/Examples/glass/index.html. And here is a list of others you can have a look at – http://inform7.com/learn/complete-examples. Nicole Lazarro (founder of XEODesign) has made a large impact on computer game development. 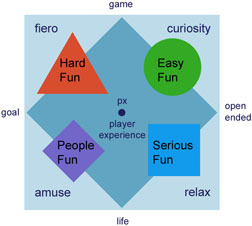 Her expertise is in emotion and design, and here are several free whitepapers on various games/emotions topics. This is the stuff of the web 🙂 OutputThis! is a part of the Structured Blogging initiative, Output this! provides is an API service to route your posts easily to aggregator applications.